Eleutherococcus senticosus, also known as Siberian ginseng, is native to the Taiga region of the Far East. Healers have used Eleutherococcus for 2000 years. 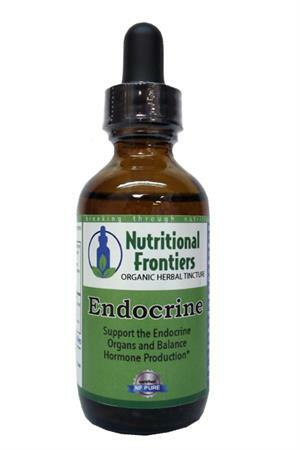 This adaptogenic herb targets adrenal function. It may improve attention, alleviate depression, and increase tolerance to stress. It is useful for people who are debilitated from cardiovascular disease and other chronic health conditions. Kelp is traditionally used to support endocrine function, particularly the thyroid gland. This seaweed offers a concentrated source of minerals such as iodine, offers a concentrated source of minerals such as iodine, magnesium, potassium, calcium, and iron. Saw palmetto (Serenoa repens) berries contain flavonoids, fatty acids, and sterols which inhibit DHT (a type of testosterone) from binding to receptors. Saw palmetto has therefore has been used to treat people with prostate disease, PCOS (polycystic ovarian syndrome), and other conditions with elevated testosterone levels. Traditional use also suggests saw palmetto can help increase appetite and energy levels. Parsley root (Petroselinum crispum) is native to the Mediterranean but now enjoys widespread use as a culinary herb. It is a potent diuretic and tones the urinary tract. Parsley root has been used historically to help the following conditions: urinary tract disorders, digestive problems, liver disease, painful menstruation, high blood pressure, allergies, and bronchitis. Some herbalists suggest that parsley root can help hypoglycemia caused by adrenal malfunction. Parsley root contains numerous vitamins and minerals including vitamin C and calcium. Astragalus membranaceus is an adaptogen used extensively in Traditional Chinese Medicine as a Qi (chi) tonic. Astragalus has affinity for the immune system and is often combined with ginseng to improve stamina and energy levels. Astragalus may also increase bile flow to improve appetite and digestion. Alfalfa leaf is thought to be an alternative for the endocrine system. Alfalfa may also support digestion by stimulating the flow of bile. Alfalfa has a high nutrient content including protein, calcium, zinc, iron, and vitamins A, B1, B6, C and K. It is well indicated for a deficient person with lack of appetite and general weakness. Prickly ash bark is a North American plant that has been used medicinally as a digestive aid and to strengthen the nervous system. Herbalists have used prickly ash (also called Zanthoxylum) for a wide variety of complaints including toothache, sore throat, upset stomach, various infections, and rheumatic conditions. Black cohosh is an herb first used by Native American Indians for the treatment of women’s health issues. Black cohosh has become a commonly used treatment for menopause, premenstrual syndrome, painful menstruation, acne, weakened bones, and for starting labor in pregnant women. Black cohosh has been utilized for anxiety, rheumatism, fever, sore throat, and coughing as well. Chaste Tree Berries are commonly used to make medicine and are sometimes referred too as “the women’s herb”. Premenstrual syndrome and menopause are just a few of the issues Chaste Tree Berries are used to help. Some men who used this fruit found an increased flow of urine. This fruit has also shown some improvement with acne, nervousness, dementia, joint conditions, colds, upset stomach, spleen disorders, headaches, migraine, eye pain, and body inflammation.